sometime just before light, sophie got all excited – jumped off the bed and ran to the door barking. that usually means there is a critter in the yard. we live in a cottage well behind the main house which sits hidden from view at the end of a dead end street. so, it’s not a case of someone strolling by! i got her back to bed and we settled down again. then, just as it was getting light – off she went again. this time i could hear something in the leaves on the ground outside my (back and over my bed) window. and mr pepe was doing his nervous looking out the side window. just as i looked out to see what was up – i saw something scurry up that huge oak tree. and when i looked toward the noise on the ground, could just see the huge (and puffed up) tail of a skunk! it was almost hidden by the storage shed, but could just see it as it did its posturing routine – its last-ditch effort to scare you away before the big spray. when i looked back at the tree – there was this little masked face staring at me from the big fork in the middle of the tree! a wise racoon!! i wish i had thought to grab my camera – tho i’m not sure the light was sufficient. mind you, that skunk was not 15 feet from my window! so glad the racoon didn’t challenge – and that i didn’t let sophie out!! mocha has been skunked once. fortunately not a very big body and very short hair. now sophie would be quite another thing! lots of long course hair. not a good thing!! i know, it was the rv i kept talking about cleaning. maybe before the next trip?? i also need to take it somewhere to be serviced. i think that means the long drive to the other side of sacramento – ugh. today i will work on a piece for the opportunity quilt. my promise is to have the top finished by end of this year. at the rate the days/weeks/months are passing i’d best get moving here!! i have several to do – some of which have not even been designed!! 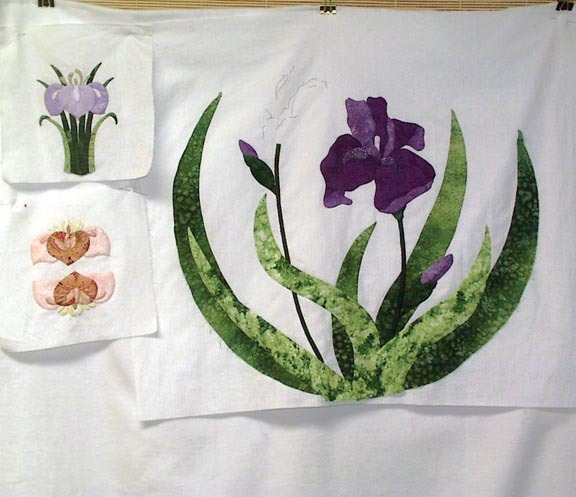 there will be all iris motifs – done in circles like my crest and floral designs. in fact, will be as many crest designs as i can find – then i will have to just wing it and make up some of my own. ^_^ at least it will give me new designs to sell! this is what i have so far – the large one is not quite finished – missing the ‘opening’ blossom. i’m just not sure about that peach mini, so i think i will do another and then choose at assembly time – or maybe use them both?! i have a third design ready to go and that is what i will be working on today – another mini. oh, and then there was the lizard. saw mr pepe in sophie’s bed – a place he never goes. seemed to be doing the claw sharpening thing, so i chased him out. he only went just out and then began trying to reach his paw under the bed. then i noticed there was a bit of a ‘lump’ in the bottom of the bed. when i lifted up one side, there was a lizard trying to scurry away. the poor thing had no feet and probably not all of any of its legs. and its tail was certainly not the length or shape one would expect. do they regenerate?? i managed to catch him/her and then hurl it back out into the wilds down the hill – where pepe couldn’t find him again, at least not right away!